Real silver charms which I purchased in the jewellery sector near the Grand Bazaar in Istanbul. 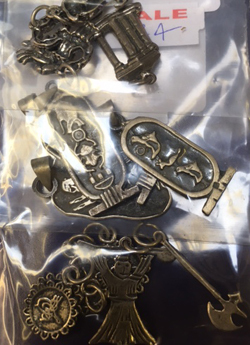 There is likely to be 4-6 charms in each pack, and each pack will vary but will have a historical theme (Roman, Egyptian, Turkish etc.) Packs will be sent at random - order more than one and we will send different designs.